February 25th in WordPress Themes by Wordpress Jedi . There are many folks who make a living online selling digital products. Even if you don’t have an e-book or an app to sell, you could always share what you have mastered with others and make some money that way. You don’t need to learn a new content management system to create courses, quizzes, and certificates for your customers though. 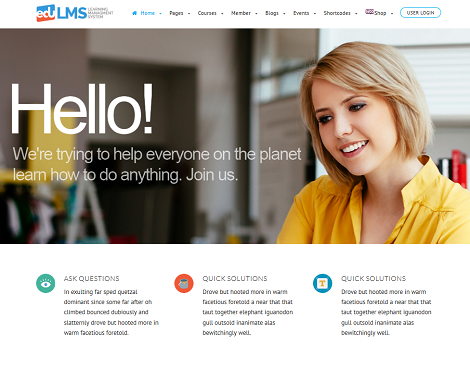 EduLMS for WordPress happens to be an elegant LMS theme that lets you share your courses online like a pro. EduLMS has a professional look and can be customized easily from the back-end. You can create an unlimited number of Courses, Lessons, and Topics. There is also an examination system, allowing you to create quizzes and set passing criteria for each. Webmasters can allow their students to download a certificate as soon as they pass a course. EduLMS is highly customizable and RTL ready. It comes integrated with the Slider Revolution plugin. The theme is responsive and has a decent mega menu system. You get various layouts and support for WooCommerce. This is a premium theme.